Summary: For those of you arriving in the Lake District from the east and south this walk is one of the most remote to get to but it is well worth the extra effort. 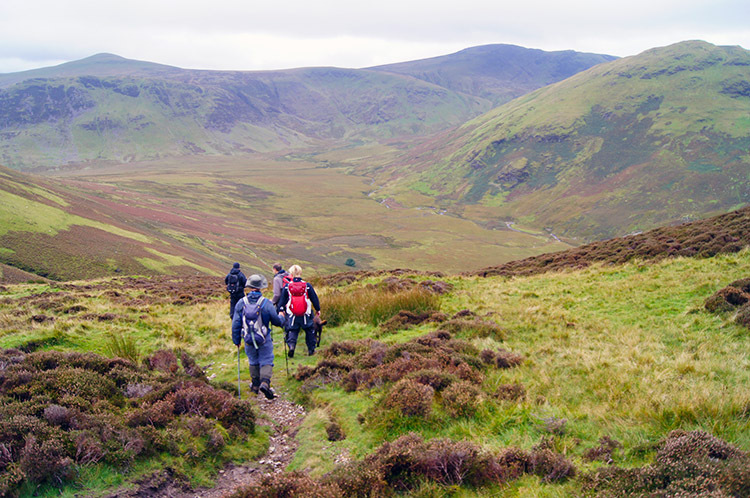 The walk begins with a short walk to Mellbreak then a steep ascent including a path through section of scree but once the exhilarating climb is done then the mountain provides excellent views of the areas north western mountains. 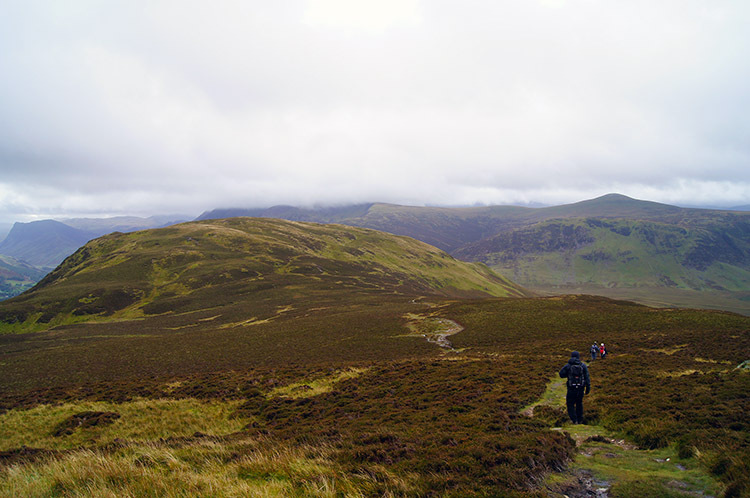 A steep descent to Mosedale follows and then another steep ascent of Hen Comb before straight down again to the marshy area of Whiteoak Moss. Up once more, this time slightly easier to Gavel Head where widespread views of the coastal plain of Cumbria are seen for the first time. 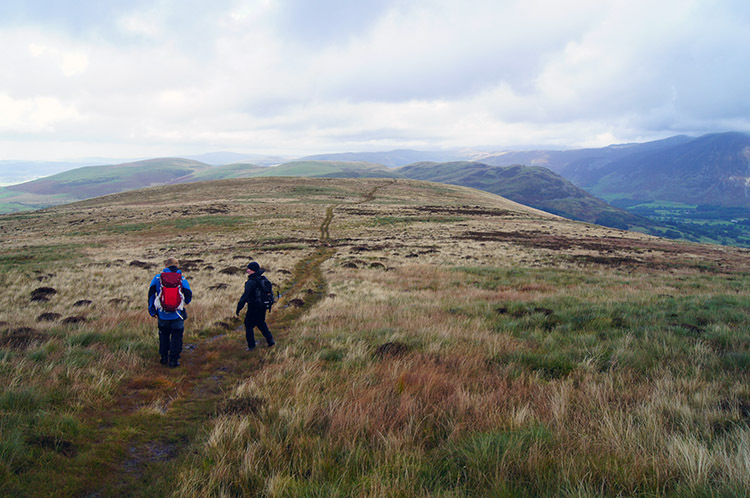 From Gavel Head the walk is a lovely undulating one to the impressive summit of Blake Fell before a short down and up again to Burnbank Fell, the fifth and final Wainwright. Yet another steep descent soon follows to Holme Wood but now the climbing is all done and the finale to the walk is an enjoyable one, first through the wood, then on the edge of Loweswater before finishing the walk along track to Maggie's Bridge and then on quiet country roads back to the Kirkstile Inn. Note Maggie's Bridge can be an optional starting point for the walk but as my fellow walkers and I planned a pint after the walk we availed ourselves of the Kirkstile Inn car park. 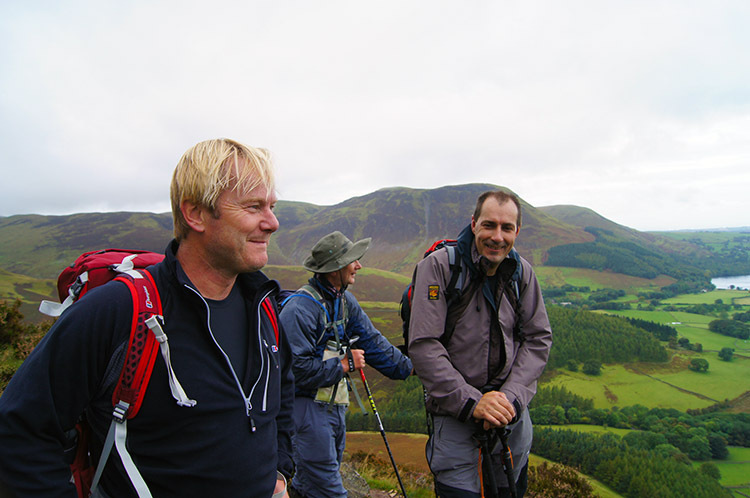 The Walk: I stayed over in Keswick with John Lister and enjoyed a few beers and a meal in the evening before meeting up with John Deasey and Neal Lever. It would be my first meeting with Neal, I had walked with both John D and John L before. Such is the popularity of social media I did not knew any of these gentlemen before I joined Facebook and Twitter, nor had I met any of them before I did last year's Great Britain end to end walk when John L joined me on a couple of stages. 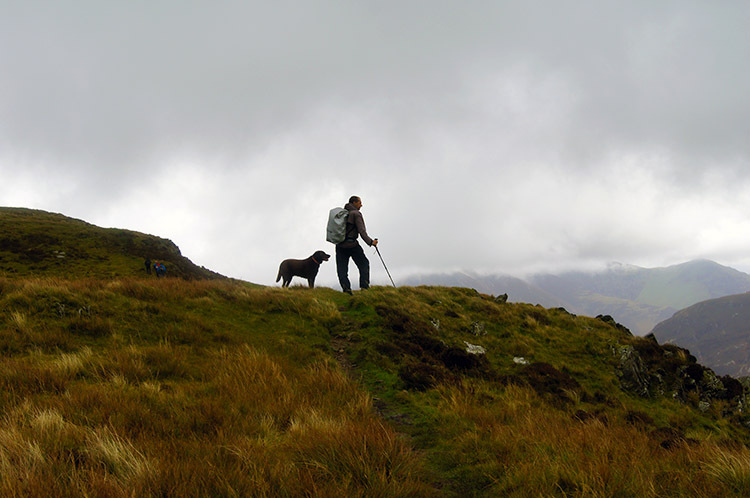 While in Keswick for the evening John D was tweeting on where to meet and as a result a message came through by someone late in the evening asking if he could join us with the request "Can I bring my dog? He is trained" I replied with one word "Absolutely" Then I retired for the evening and after the meal and few beers I slept soundly. I woke up on the morning and looked out of my hotel window in the centre of Keswick to see overcast skies with a little rain falling but the clouds were quite high at about 500 metres which boded well for the day. We were promised fresh breezes, occasional showers and dry periods which sounded perfect. After breakfast I led the way from Keswick to Loweswater in the dependence of my SatNav with John following closely behind. The journey over Whinlatter Pass had a particular highlight for I saw a Red Squirrel perched on a drystone wall as I drove past. I felt I was in for a really good day on seeing that rare and beautiful sight. 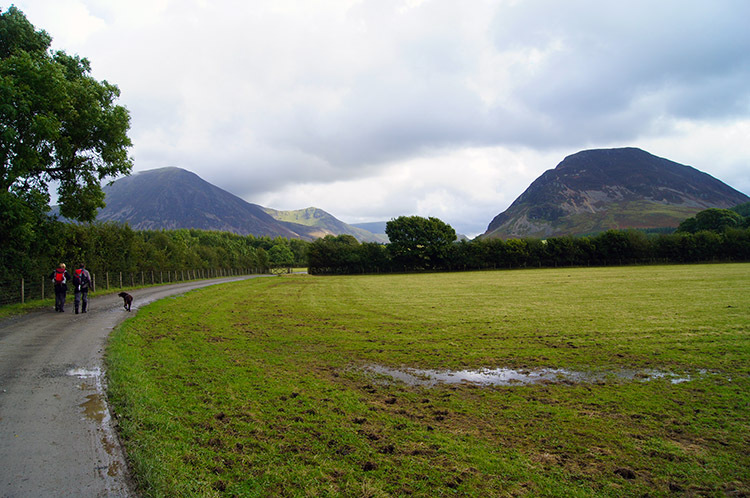 Despite a minor SatNav initiated detour we safely arrived in Loweswater before the 9.00am scheduled I had agreed with John D. He and Neal arrived five minutes after ETA, not bad at all and by then we had met up with the mystery walker and trained dog, a distinguished tan brown Labrador. Thus John Deasey, John Lister, Neal Lever, Peter Dixon, Oscar and I were assembled in the Kirkstile Inn car park and soon after we were on our way. 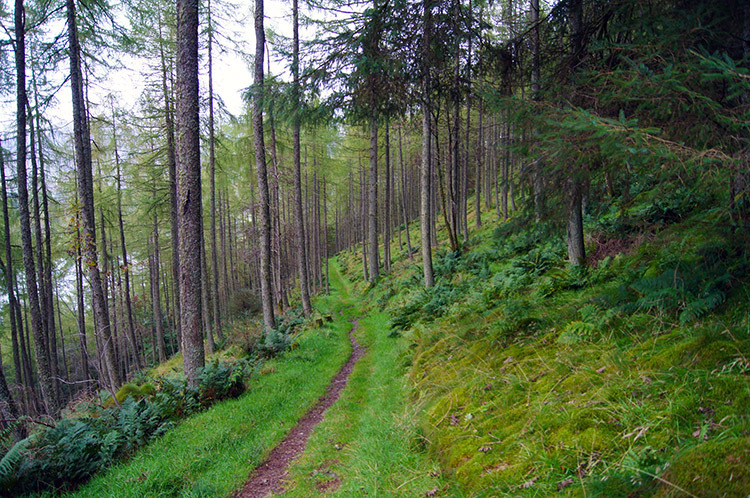 The walk began easily enough on a steady gradient for one kilometer to the foot slopes of Mellbreak. We knew the ramble would soon get tougher though, the formidable north face of Mellbreak was directly in our eye line and therefore we knew what was coming. 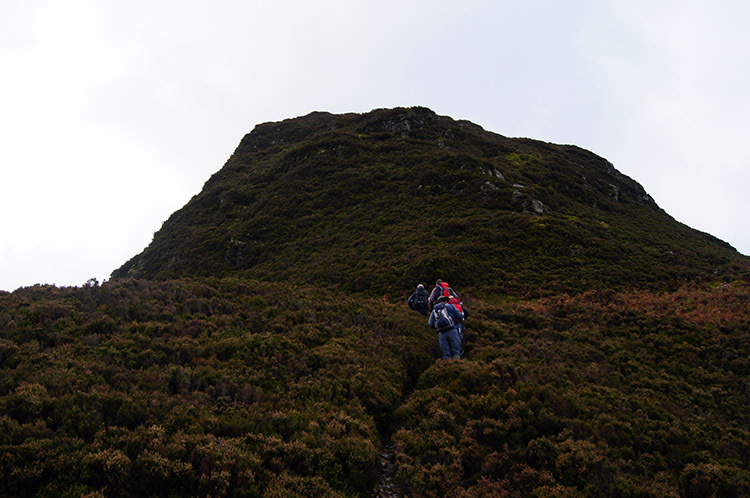 Sure enough the climb soon became a steep haul up the lower slopes of Mellbreak and there was no respite. The next kilometer was to be on an average 30% ascent and made harder by the fact that some of it was over scree which slipped down the slope as we trod over it. 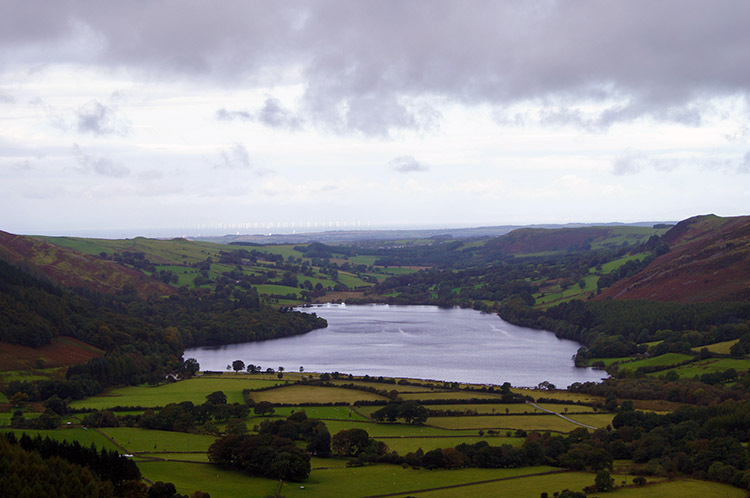 I took convenient breaks to look over the land which looked more impressive as we climbed, in particular Loweswater which was emerging into full view; a glorious sight it was. 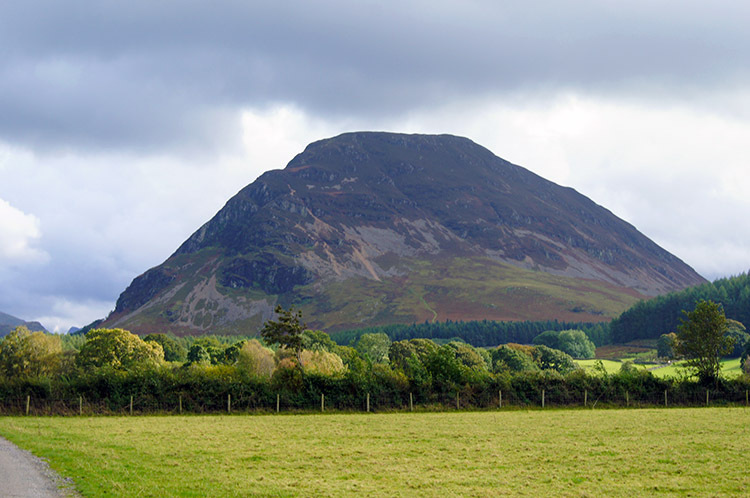 One mention of Mellbreak as I continue the description of the climb. 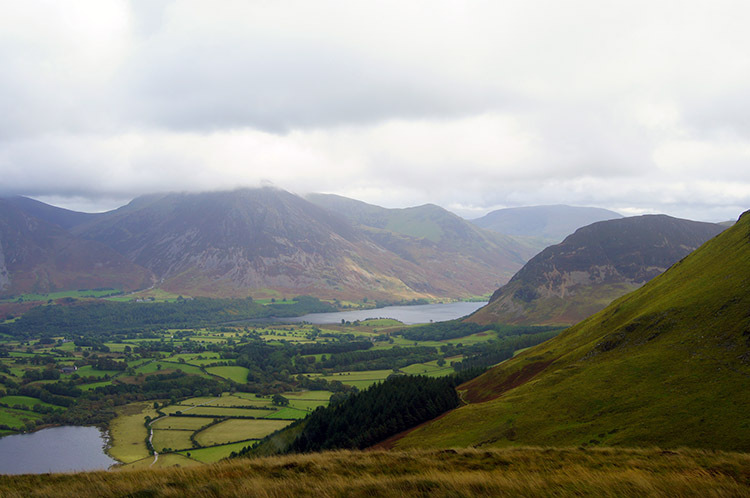 I have always been drawn to look at it whenever it is in view as its close association and aspect with Crummock Water is a joy to behold. 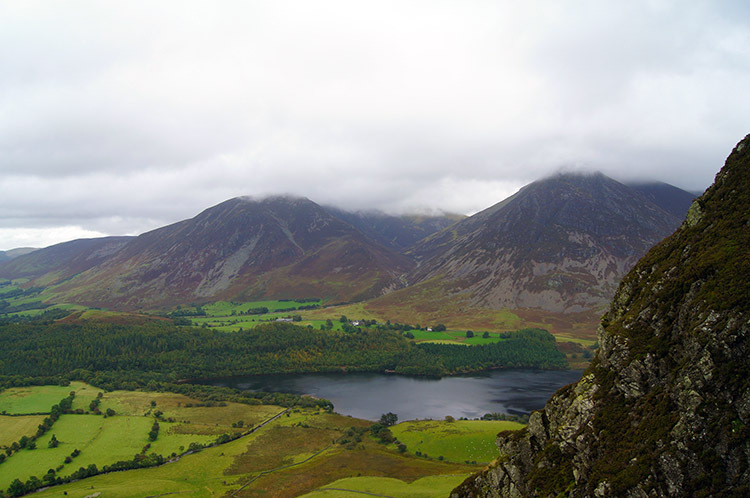 Even Wainwright regarded it the best partnership of mountain and lake after Wast Water and the Screes, a view with which I concur. Now back to the huff and puff of the ascent. As we continued to climb from the scree line I stopped for short breaks. Neal called to me "Too many beers last night? Are you struggling a little Mike" I replied "Not really, I am stopping to take photographs" That was true but the breaks to take the photographs were most welcome excuses to take it easy on the steep haul up. 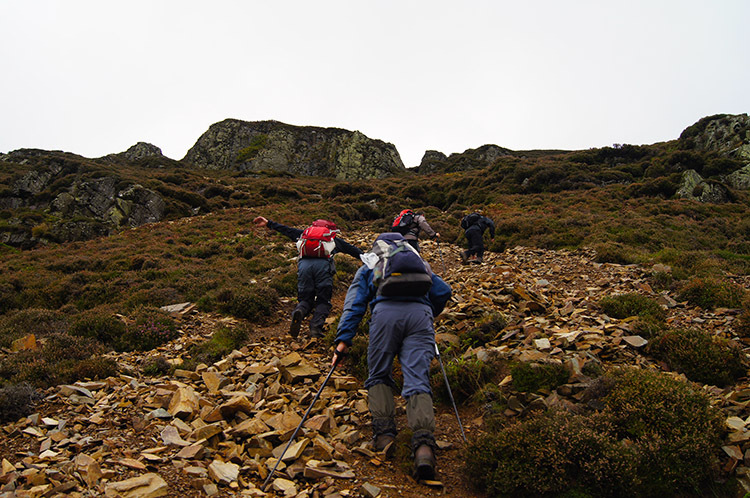 Wainwright himself said of the climb "The short climb (by the direct route) is a grand way to the top - except for the initial scree. It is especially beautiful when the heather is in bloom. The upper part of the path is a joy to follow. Steep, but no difficulties" Again, the old master was spot on, we were about two weeks late for full heather bloom but there was the odd remaining patch which allowed me to imagine how it was then. The good path through the heather was best on the final steep section to White Crag and from there on the levelling climb to the summit. At the summit we all took a short break, one which we all enjoyed. We had all earned it and by the look on the faces of my walking colleagues they had enjoyed the hard climb to the summit as much as I, all true mountain men. Oscar just relaxed, he too looked as if he was at home on the mountains and high fells which he was for Peter told me he liked it even better when he is bounding his way through deep mountain snow! I thought on; John Lister had recently been walking in Patagonia and Peru, Neal had been on a trek to Everest Base Camp and to the Alps and Peter with Oscar were regularly walking in the Munroes of Scotland including wild camping while John Deasey is often fell running or mountain biking over the Pennines near Rochdale. At least I had done the Great Britain end to end 1,120 miles in consecutive days last year. Good job I did or I would have never been able to keep up. Mellbreak provided some lovely views while we took our break. 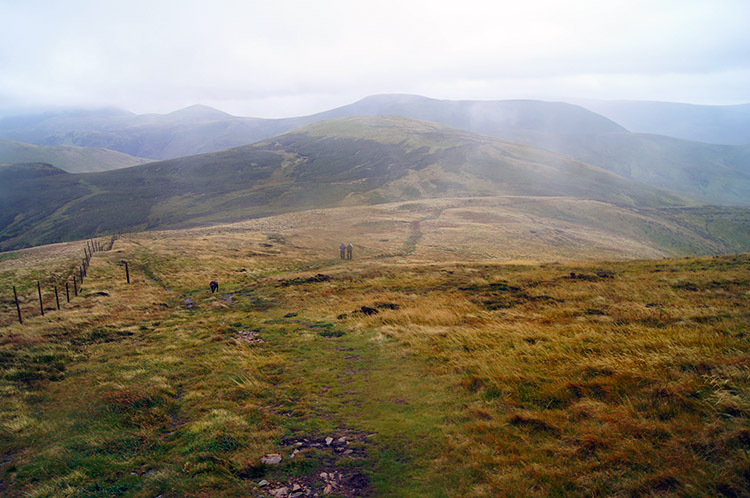 From the summit we could see Fellbarrow and Low Fell the two most north west fells in Wainwrights list of 214 Lake District fells. Nearest to us were Whiteside and Grasmoor to the north east. 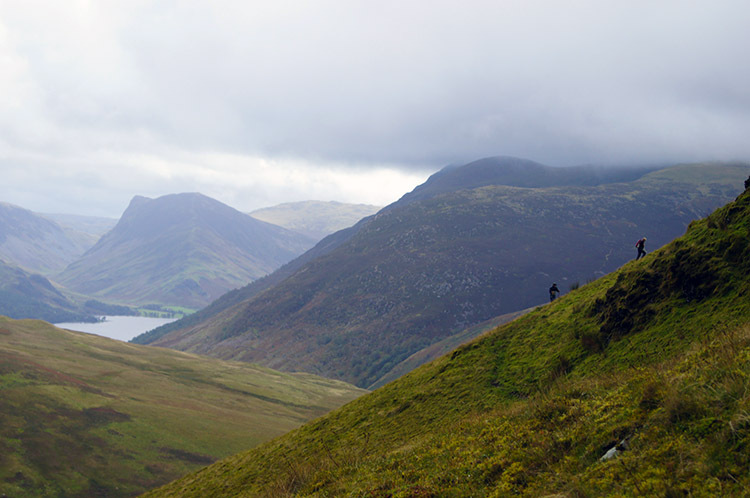 Turning to the south east most prominent was the jutting profile of Fleetwith Pike while to the west were the remaining fells of this walk with Hen Comb next in line. A beautiful glint of sunshine enhanced the view as we looked out over the high landscape. Then it disappeared so we packed up and made our way south and west off the mountain. We did not make our descent immediately but made our way to a band between Mellbreak's north and south tops which we found and followed the path down into Mosedale. 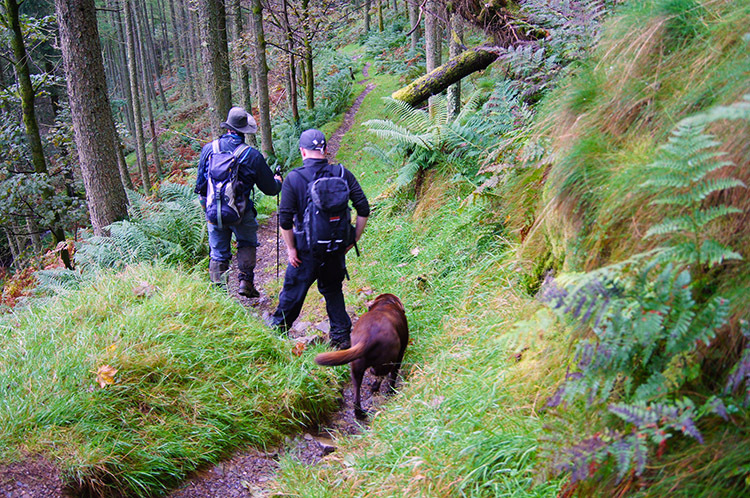 First the descent was OK on a good path but soon it became much steeper and the path less conspicuous. As I often do I traversed my way down the steep slope by walking well away from the true path line and seeking out gentler undulations. I found it much easier than putting on the full knee, feet, ankle and calf brakes and though I covered more distance than some who took a relative beeline we all reached the end of the steep section at the same time. 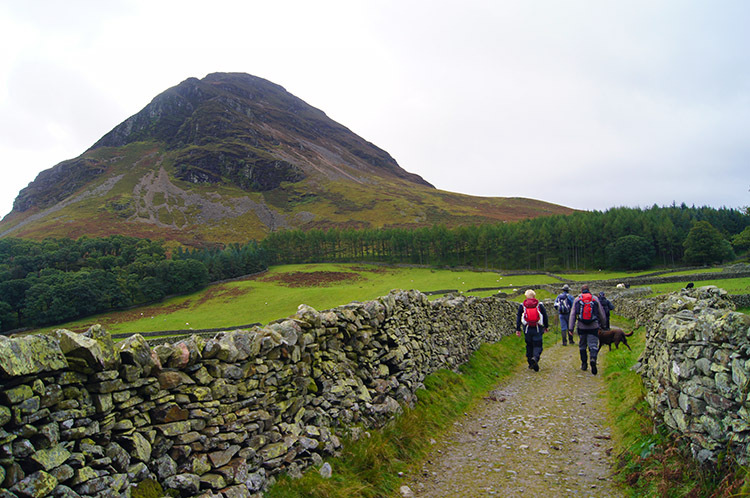 Then we headed for a stile and crossed it to walk along Mosedale and towards Mosedale Beck. 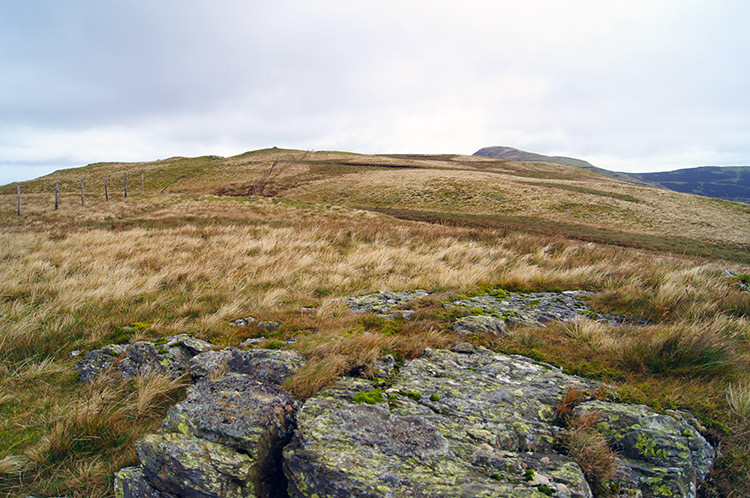 I could have done with a break after the steep climb of Hen Comb as the others did but it was cold on the small grassy domed top of the fell which had a small cairn but no other distinguishing features so I told them I would amble down the fell and begin the walk to Gavel Fell where I would meet them. 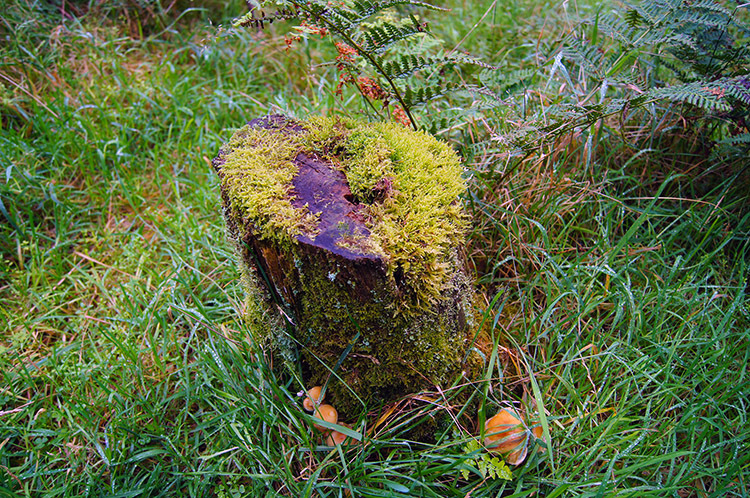 Therefore I continued past my resting colleagues and traversed down the fell towards Whiteoak Moss. It was an easier traverse than the one down from Mellbreak but with no path to follow my decision on route was made by looking across the expanse of the marshland and deciding on the appropriate gradient to make the next climb. Therefore I headed a little further south than the true line before reaching the moss and making my way across the squelchy ground. It was not difficult crossing the wet ground of the moss and there were plenty of evenly spaced grass tussocks to keep my feet out of water. 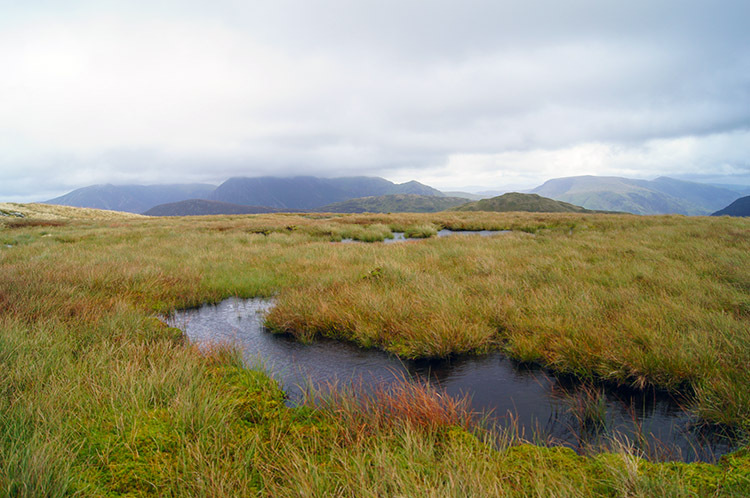 Nevertheless the tussocks were not everywhere and not always accommodating to even step so now and again I put my boots into water and squelched my way through. Never once did my boots take water though, it was not as unpleasant as expected and for walking on the last Friday of September after a rain sodden summer not bad at all. 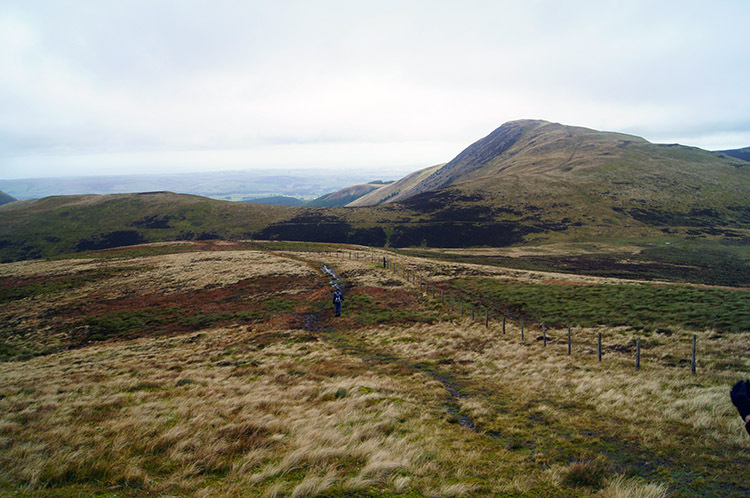 After completing my crossing of Whiteoak Moss I began the ascent of Gavel fell by heading for a fence line running up the south side of Gavel Fell. While on the early part of the ascent I looked back to Hen Comb and saw four miniature figures beginning to cross the marshland; my walking chums were on their way. Continuing on my steady climb of the south side of Gavel Fell and before I reached the fence line I came across an interesting area of features including some rock outcrops in the grassland and nearby a series of small pools which nicely broke up the local grassed landscape. Further up and beyond the pools I walked a steeper incline and reached its peak to spot the summit cairn of Gavel Fell for the first time. It was some 600 metres way still but an easy amble to the cairn as I knew my walking mates were some way behind. Sure enough I reached the summit five minutes before Peter, Oscar and John D and ten minutes before Neal and John Lister. 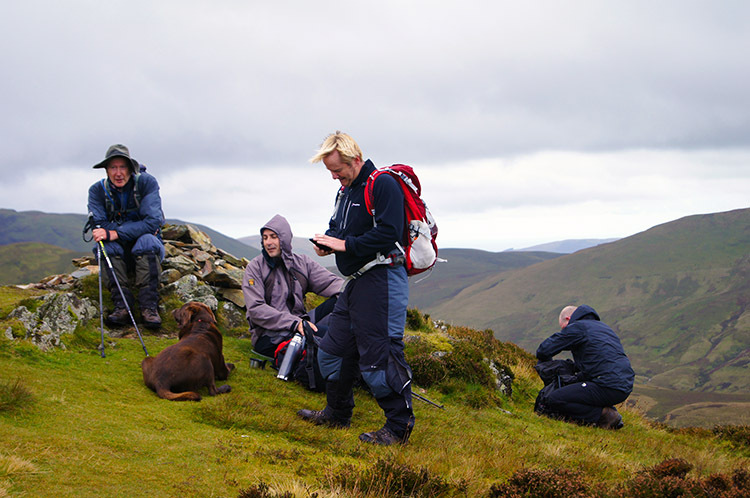 With all the team assembled again we moved on promptly in a northerly direction towards Blake Fell. 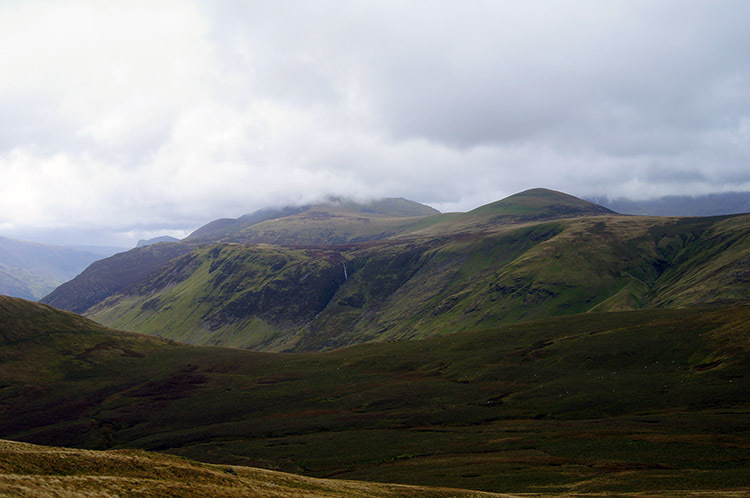 The view to Blake Fell from Gavel Fell was lovely with a slight rising ridge to an abrupt headland summit. 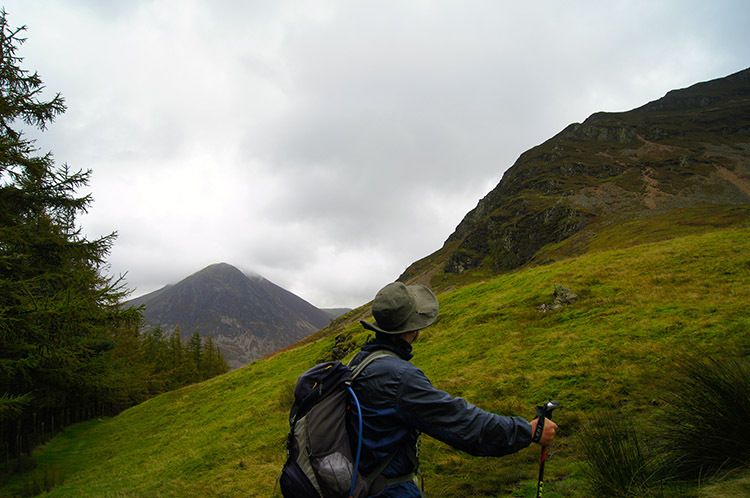 It is the highest of the Loweswater Fells but did not look at all imposing from our stance with just about 50 metres difference in height between where we were and the top. 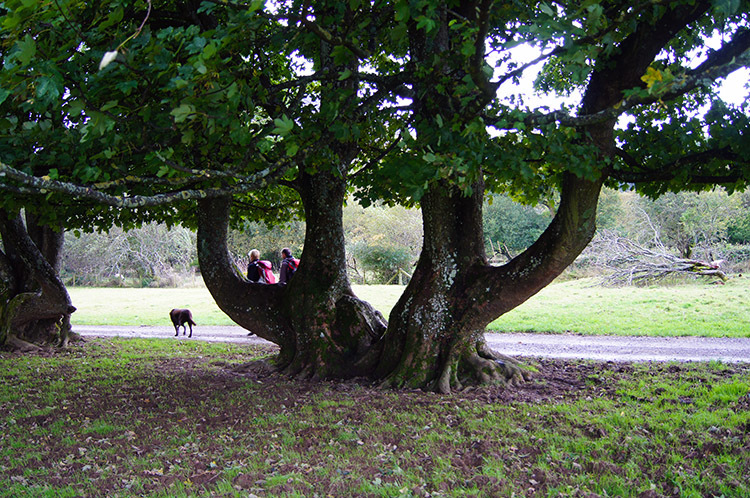 Admittedly we had a slight drop before climbing up to the top but it was a great piece of ground to cover. It was just as well the going was good on the raised land between the two fells for the cloud was lower now and mist beginning to snarl in the wind blowing over the tops. 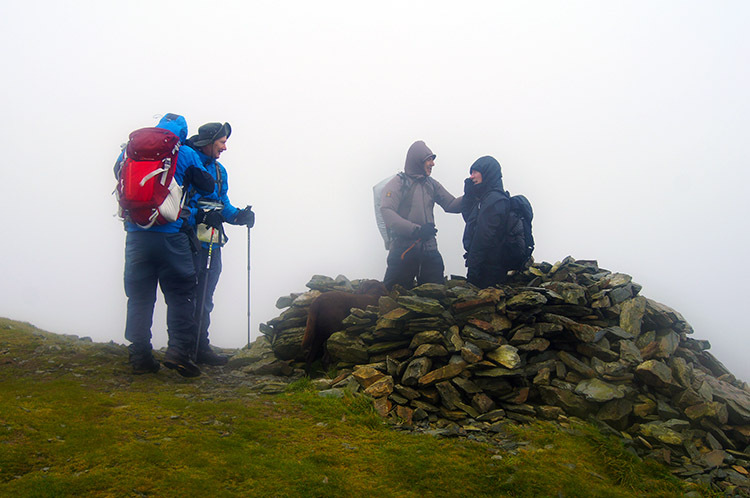 After covering up and making the distance between the two we all reached the summit of Blake Fell with more clothing protection than when we left Gavel Fell. For the first time since springtime my hands also felt cold when taking photographs so it was no surprise when Peter checked his wind gauge and told us we had experienced winds of up to 52mph during this stage of the walk. Still we stayed a while, tough and resolute in the face of all the elements threw our way. Rain squalls were quickly replaced by dry spells such was the wind speed and the view from Blake Fell was a good one. 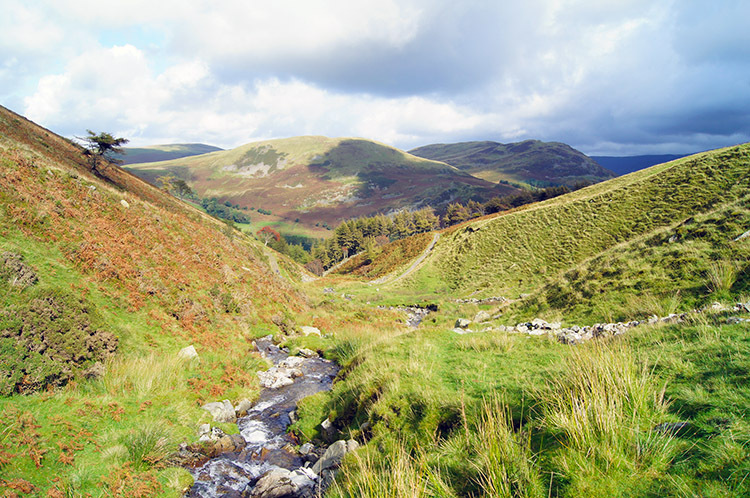 John Deasey liked the view to Murton Fell and Conga Moss below. 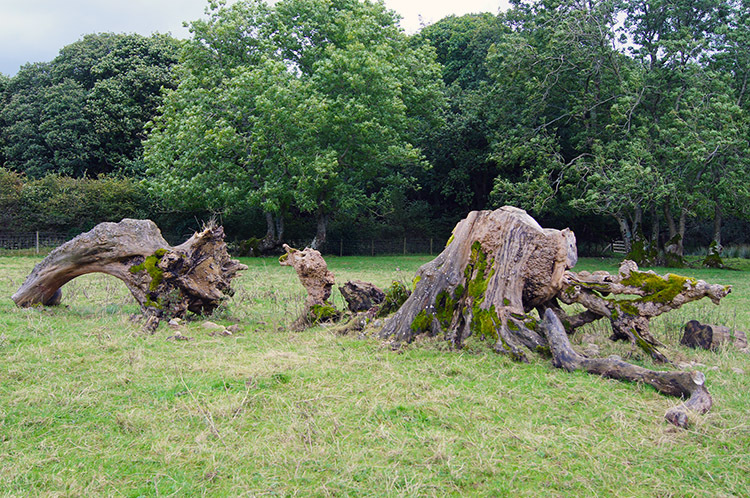 Conga Moss was originally created as a reservoir by damming the downstream end of a watercourse but ceased to supply drinking water some years ago and now serves as a fishing lake. Other views included an excellent vista south, west and north of the Cumbrian Coast and Solway Firth. There were also especially good views to the array of north western and west central mountains. I digress now. We all know the saying ‘go the extra mile’ or ‘ walk the extra mile ‘ which means to do more and make a greater effort. 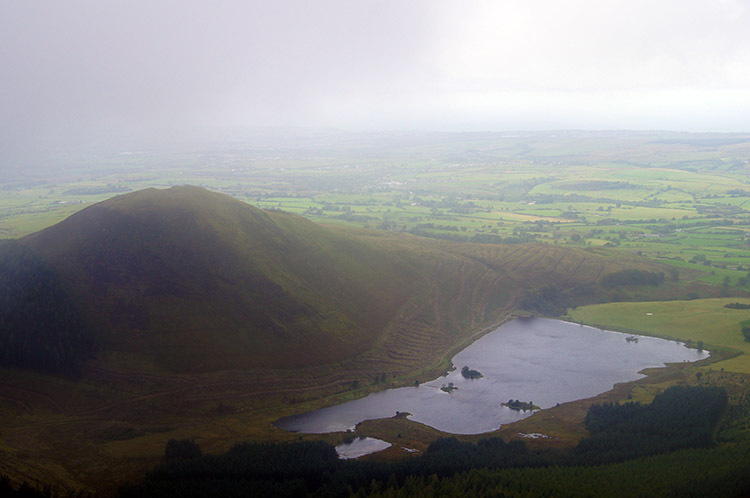 As they say about a person’s character “He's always willing to go the extra mile to do things right” Now I would like to say that applied to me after leaving Blake Fell but by assuming I was walking towards Burnbank Fell and not checking the GPS or taking a bearing I was erroneous. Only a half mile later did Peter realise we were on Carling Knott and stopped us before we began to make an irreversible descent. I checked the GPS, quickly turned tail and headed back towards Blake Fell before cutting across the north east edge of the fell top to track to make the track to Burnbank Fell. (Note: the map and route files show the true course and not the extra mile!) No disaster then, just a little hiccup and the celebratory pints waiting a little longer. 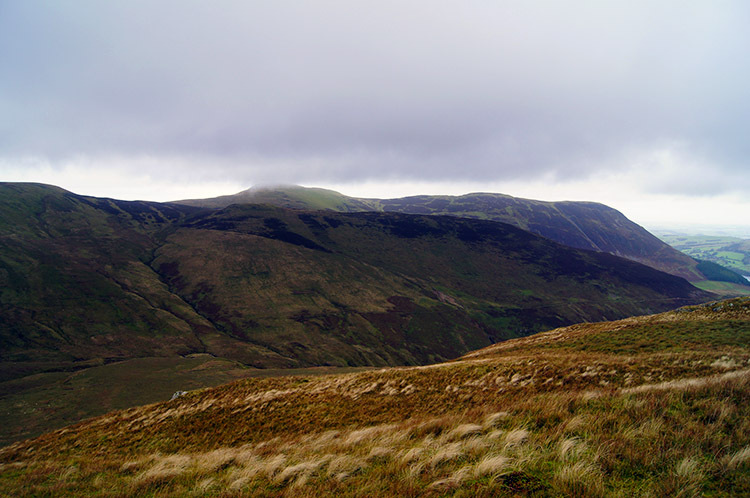 It did not take much effort to make the journey across the high ground to Burnbank Fell, all of the distance covered on good ground with only the slightest continuous incline from the saddle between the two fells. Once at the top of the fell we took in our fifth and final Wainwright view, which as he stated “includes an uninterrupted panorama from the Isle of Man (seen over St Bees Head) round to Criffle in Scotland” Alas we could not see the Isle of Man because of the cloud and mist still swirling in the gusting wind. 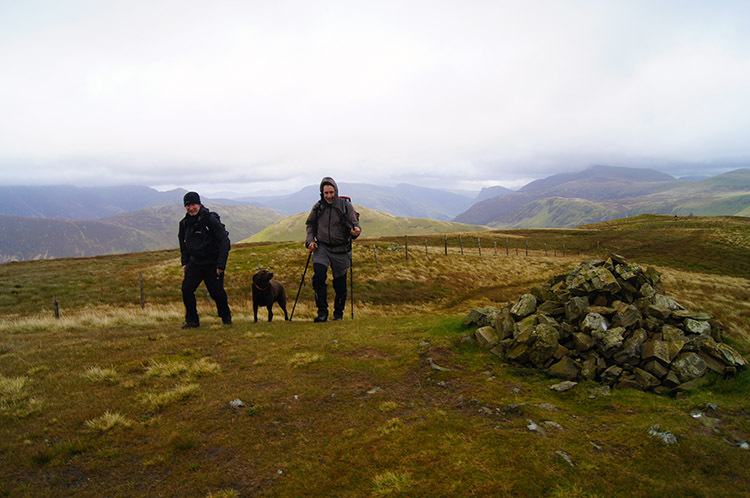 From Burnbank Fell Peter led us east on first and a slight decline and then on a steeper descent of the fell beside a wire fence. Once again I traversed down on wide sweeps as did John Deasey and Neal ahead of me while Peter, Oscar and John Lister stuck close to the fence. 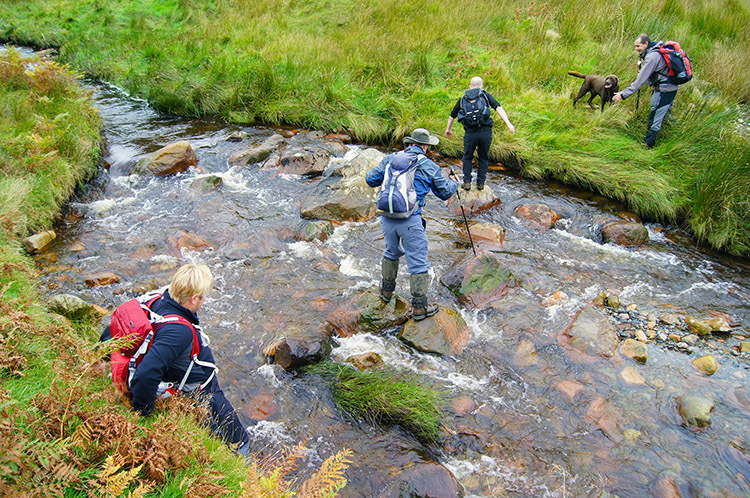 After scrambling down to Holme Beck I rested a while to re-tie my boot laces which had loosened on the descent through fern and heather before joined the rest of the group by a wood bridge over Holme Beck. 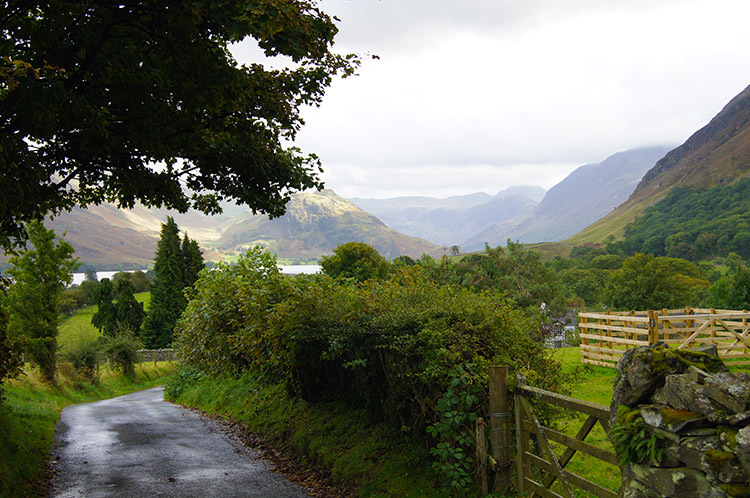 From Holme Beck we walked along a track and through a gate into Holme Wood which we walked through and down to Loweswater. 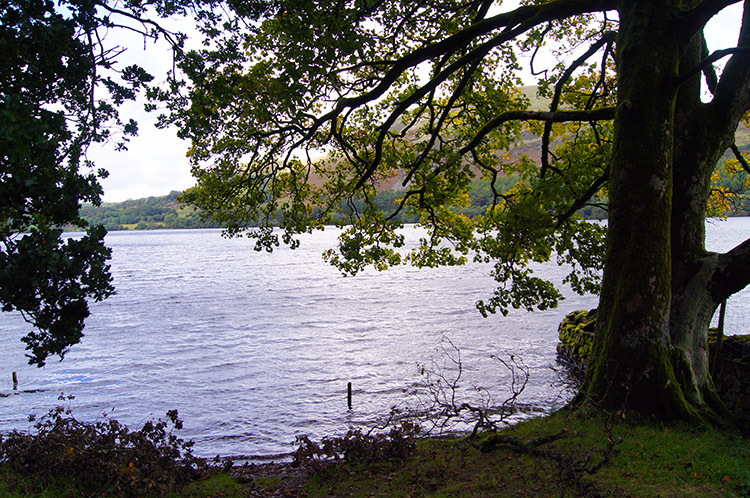 The walk through the woodland was delightful and nice variety to the earlier walking on the magnificent Loweswater Fells. The woodland was mainly managed evergreens but not wholly with a nice interspersing of native deciduous, most on the edges of the wood to break up the uniformity of the conifers. 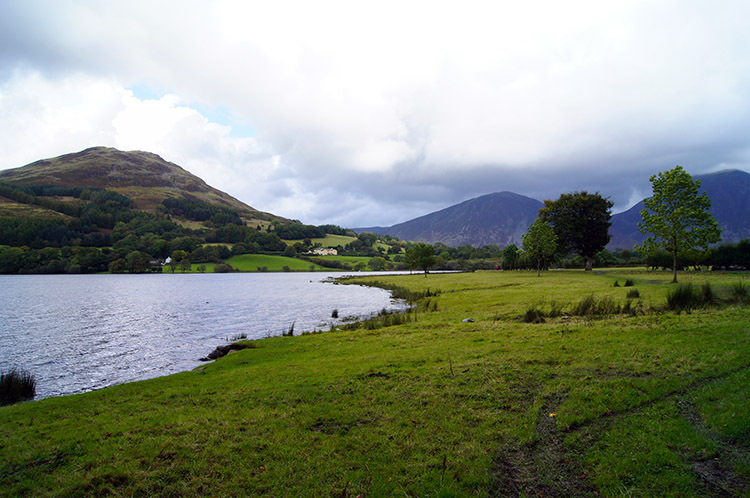 At Loweswater we edged along the south side of the lake past Watergate Farm and then along a track towards Maggie’s Bridge. All climbing and descending done, now was the time for gentle conversation. And so it was at this time that Neal and Peter spoke about wild camping and what equipment Peter used on his night’s up in the Munroes. No tent, but Tarp, under sheet and plenty of cover from both he and Oscar we part of the equipment list. While they talked I listened and further up the road both John’s talked about something else, something unknown. After Maggie’s Bridge track turned to road and a few hundred metres later road ended at the Kirkstile Inn car park. It was five and a bit hours after we had set off but a great five a bit hours of great walking in absolutely superb company and company I will keep on the fells again in the future, perhaps even the whole group one day which would be very nice. To finish our day together we retired to the pub for a pint before going our separate ways. 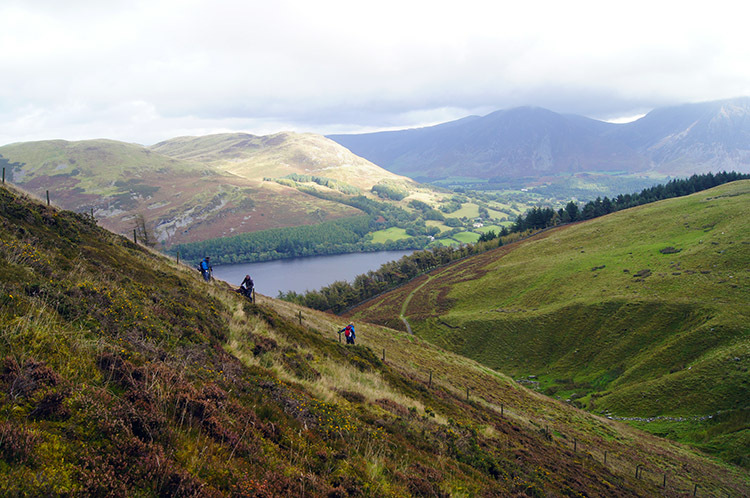 Five pints later, all enjoyed and all thoroughly earned on a fantastic day out walking on the vastly underrated Loweswater Fells we said our farewells and went on our different ways home. As I left I looked over to Mellbreak, once looked at in mysterious awe from Fellbarrow and now I looked at the magnificent mountain as a dear friend.